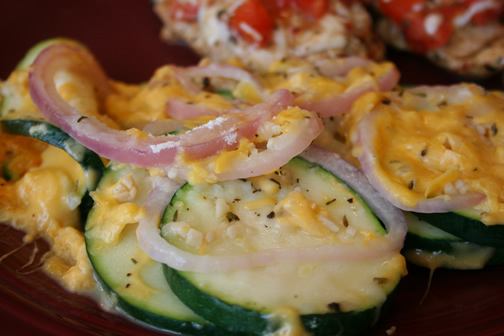 This was our favorite of the zucchini side dishes we tried this week. Heat grill to 350 degrees F (medium heat) and oil well. Place zucchini in a sieve set over a bowl, salt well, toss to coat, and set aside to let drain, at least 5 minutes. When ready to cook, oil 1 piece of aluminum foil on 1 side. Sprinkle 1/4 cup cheese in the middle of the foil to form a rectangle, shingle 1/4 of the zucchini over cheese (about 3 rows of 8 zucchini coins). Sprinkle 1/4 cup of the shallots and 1 teaspoon of garlic evenly over top, and season with salt and freshly ground black pepper. Top with another 1/4 cup cheese, sprinkle with 1 teaspoon all-purpose flour, and top with 4 sprigs of thyme. Enclose foil tightly to form a packet and repeat to make 4 packets. Place the packets on the grill and cook until zucchini is soft and cooked through, turning once, about 10 minutes total.